Unfortunately, people recovering from injury or the elderly may not be able to tolerate these loads, which can limit their ability to have an adequate strength and hypertrophy response. 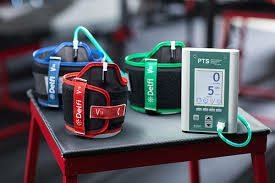 Personalized Blood Flow Restriction Rehabilitation (PBFR) is a paradigm shifting intervention for the rehabilitation professional with over 160 peer-reviewed articles in the scientific literature. By applying a surgical-grade tourniquet briefly and intermittently to an exercising limb you can induce significant and substantial strength, hypertrophy and endurance changes while using a very light load. In a study by Abe et al., they examined BFR cycling at 40% VO2 Max for 15 minutes compared to a control group that cycled for 45 minutes at 40% VO2 max without BFR. Thigh and quad muscle volumes increased, extension strength increased, and VO2 max increased in the BFR group compared to the control group. (Abe 2010). HOW DOES PBFR WORK AND WHO IS APPROPRIATE TO TREAT WITH IT? The exact mechanism behind the positive results seen with PBFR is still being extensively researched. Theories range from a significant build-up of metabolites by anaerobic metabolism, a systemic anabolic response, and cellular swelling. It is most likely a combination of multiple factors. It does appear that muscle protein synthesis plays a significant role after PBFR as this has been consistently demonstrated in the literature. Clinically we have applied it to many diagnoses with very positive results including but not limited to total joint arthroplasties, Achilles tendon repairs, fractures, rotator cuff repairs, muscle strains, nerve injuries, post-operative cartilage arthroscopies and reconstructions, and tendinopathies.